There's never a dull moment at Best Buy (BBY), and now the beleaguered retailer has a new CEO to smoke out. Brian Dunn is stepping down after 28 years with the company -- and three as CEO -- amid a probe into his personal conduct. "I leave it today in position for a strong future," Dunn claims -- except he doesn't. 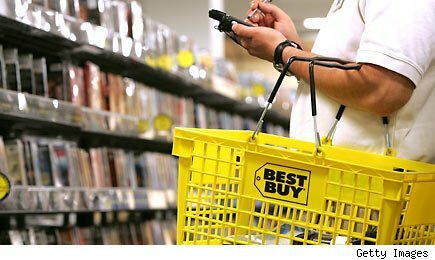 Best Buy's in trouble, and the announced layoffs and store closings are just the beginning. Store-level sales have been slipping for more than a year, and there's little reason to expect that to change. However, while Best Buy may be dying, it's certainly not dead yet. Thinking outside the big box, there are ways to get it back on track. 1. Stop Shoving Big, Bulky, Hard-to-Ship Items to the Back of the Store. While Conn's will be more than happy to sell you a new high-def TV or a laptop, it also sells a ton of appliances, furniture, mattresses, and even lawn-care equipment. Sure, Best Buy sells appliances as well. Walk into a store and you'll typically see the row of washers and refrigerators -- way off to the side. No wonder appliances made up just 5% of Best Buy's sales this past quarter. Smaller chains, including Conn's and hhgregg (HGG), place their appliances front and center. The key here is emphasizing bulky items that are both cost-prohibitive for Amazon.com (AMZN) to deliver and even trickier to return. Yes, there are already Web-based retailers selling mattress sets and mowers, but emphasizing bigger items that favor local delivery specialists would buy Best Buy some time. As bad as the market has been for consumer electronics, the video game industry has been downright crushed over the past three years. People just aren't buying video game systems or disc-based games in this age of free apps and social networking games. However, GameStop (GME) has managed to hold up far better than its decaying industry during the sector's downfall. One of the biggest reasons for GameStop's success during the industry transition, and even the recent recession, is that a big chunk of its business comes from buying back used games, which it refurbishes and sells at healthy markups. GameStop scores bigger margins on used games and gear than it does on new items. More importantly, customers trading in their old games typically use the proceeds as in-store credit to buy something else. Best Buy has already followed GameStop in accepting video game trade-ins. It will also accept many other lightly used consumer electronics, which it swaps out for store credit. However, Best Buy isn't aggressively promoting this part of its model. More importantly, the items being traded in aren't winding up for sale at its stores like they do at GameStop. Best Buy's program simply uses the trade-ins for parts through Geek Squad or resells them through secondary market channels or dedicated Best Buy outlet centers. Why not resell them in the stores where they are actually traded in? Yes, returns may increase as folks complain about the functionality of pre-owned goods. Suppliers would also cringe at Best Buy resales, which would cause them to miss out on a piece of the action. GameStop hears this all the time, but the small-box concept appears to be holding up just fine, and it sells a ton of secondhand stuff. Best Buy needs this, because it may be the only way it can effectively compete against Amazon and other online retailers on price. Consumers wouldn't assume that Best Buy's offerings will be more expensive, and they will make repeat visits to make sure they don't miss out on one-of-a-kind deals. If you think consumer electronics has it bad, walk into your local video rental store. The country's largest DVD rental chain emerged from bankruptcy two years ago, and its nearest rival had to liquidate its entire operation. However, Coinstar's (CSTR) Redbox has filled the void with surprising success. The DVD is dead? Tell that to Coinstar. Its Redbox business soared 40% in its latest quarter. Best Buy isn't in a position to acquire Redbox. However, there's nothing stopping Best Buy from entering the kiosk market itself, or possibly even pairing up with Redbox for a joint venture. Situating DVD and video game rental machines just outside its stores would help increase store traffic. Every rental is followed by a return. More importantly, Best Buy can use these machines to accept DVD, Blu-ray, CD, and video game trade-ins from people who don't want to deal with customer service lines or store hours to trade in their media. It may be too late, of course. The interim CEO is a board member who cut his teeth as a health-care services executive, so maybe he was promoted just to see if the chain still has a pulse. However, if Best Buy is to succeed, it will have to fight Web-based merchants with advantageously local merchandise, lower price points, and increased shopper engagement. These three suggestions -- while far from perfect -- would at least nudge Best Buy in the right direction. If you have an idea for how to save the staggering retailer, share it in the comment box below. Motley Fool contributor Rick Munarriz does not own shares in any of the stocks in this article. Motley Fool newsletter services have recommended buying shares of Coinstar, hhgregg, and Amazon.com and writing covered calls on GameStop.